Corey Winchester, history and social sciences teacher at ETHS. Winchester was selected for the Teach Plus Illinois Teaching Policy Fellowship to empower teachers in practice and policy. When Corey Winchester was a student, school was never about a “transactional” relationship in which a student goes to school just to get grades. For him, it was always about learning, a mindset he credits to his family and first-grade teacher. Winchester (SESP ’10) is one of 20 teachers in Illinois selected for the 2018-2019 Teach Plus Illinois Teaching Policy Fellowship. The nine-month program brings together teachers from across the state to improve policy and practice in education, working on issues such as school discipline, teacher preparation and retention of teachers of color. Winchester has been a history and social sciences teacher at Evanston Township High School since 2010. When he was a Northwestern student, he served as a tutor at ETHS in 2008 and taught at the school in 2009 and 2010. As he began thinking about career options, Winchester said he wanted a space to find out more about who he is as a black man. “That’s when I decided that I wanted to go into teaching,” he added. Teach Plus is a nationwide nonprofit organization that empowers teachers to ensure their values are voiced in education policy. Josh Kaufmann, the senior executive director of Teach Plus Illinois, said the fellowship program helps teachers learn about education policy and how to become education advocates. Kaufmann said they typically receive about 100 applicants for the fellowship. Previous cohorts of Teach Plus fellows have influenced Illinois school funding and provided recommendations to the state’s accountability system, Kaufmann said. Winchester is currently working with five other Illinois teachers in the program, focusing on recruitment and retention of teachers of color. In 2016, more than 85 percent of secondary school teachers nationwide were white, despite the fact that the majority of students in public education are not white, according to the U.S. Bureau of Labor Statistics. Winchester said these inequities stem from institutional and systemic racism in the education system. He said the fellowship has allowed him to reconcile his responsibility to the entire state of Illinois as an educator, beyond his responsibility to his students and colleagues at ETHS. Nicole Parker, the chair of the history and social sciences department at ETHS, has worked with Winchester since he started teaching. He is an “evolving teacher,” continuing to learn and grow in his profession, she said. Parker emphasized Winchester’s focus on student voice in his classroom and beyond. 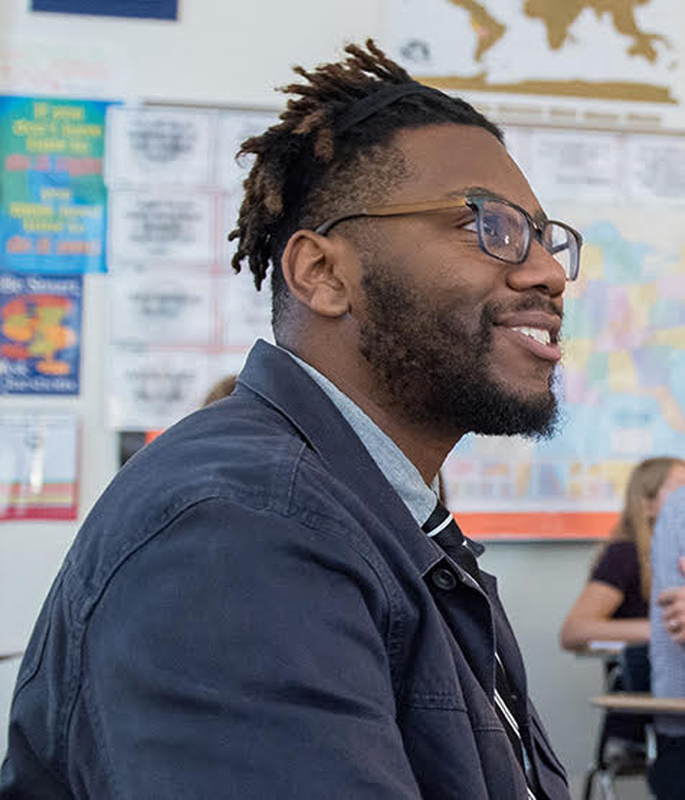 “That idea of being student-centered and empowering students and having their voice really permeates all the work he does, whether it’s teaching U.S. history content or working with teachers who are in our building for the first year or working with students in an extracurricular kind of capacity,” Parker said. Parker also highlighted Winchester’s work with Students Organized Against Racism, a group focused on involving students in the school’s equity work and developing an anti-racist culture. Parker said Winchester empowers students in this group to take ownership of the work SOAR is doing. Winchester said his drive for teaching centers around relationships with students and helping them discover their personal identities.